The following Haaretz report sounds completely untrustworthy. How could Abbas and his entourage be “unaware of the content of Bush’s letter,” for Assad and yet the Palestinian who has presumably leaked the contents to Haaretz was in the know? How could Jack Khoury publish something that sounds so improbably silly? Jerusalem sources denied over the weekend any knowledge of a U.S. proposal to Syria, to the effect that Israel would pull out of the Golan if Syria severs its ties with Iran, as reported in the Kuwaiti newspaper al-Jarida on Friday. U.S. President George W. Bush has apparently offered his Syrian counterpart, Bashar Assad, to press Israel to withdraw from the Golan Heights if Damascus promises to cut its relations with Iran, the Kuwaiti newspaper al-Jareida reported on Friday. According to the report, Bush made the offer in a handwritten letter transferred to Assad by Palestinian President Mahmoud Abbas. A Palestinian source close to Abbas told the newspaper that the U.S. had presented the offer in a meeting with Syrian officials day earlier. If Assad agrees to the American proposal, he will carry out his end of the deal in the coming weeks, said the report. Bush is keen on implementing the deal before the upcoming U.S. elections, said the newspaper, in order to significantly advance the peace process before the end of his term. The Palestinian source said that Abbas and his entourage were unaware of the content of Bush’s letter, as it was meant to remain covert and away from diplomatic eyes, according to the report. Even the American envoy in Damascus was not privy to this information, said the newspaper. Despite this, the Palestinian source said that Abbas’ latest visit to Damascus was intended for the principle purpose of passing on this letter, said the newspaper. While on the visit, he scheduled no meetings with Palestinian officials or other diplomats in the area. “Since 2006, the United States has committed more than $410 million in security assistance to the Lebanese Armed Forces, and the United States will continue to provide equipment and training to the LAF,” US announces. [Landis Analysis]For the time being, it appears as if the LAF will only be receiving “additional automatic grenade launchers.” There was no mention of the attack helicopters that Lebanon has been requesting. But Intelligence chief Hayden and other top US officials have been to Lebanon of late in an effort to access whether the LAF can be counted on to fight Hizbullah rather than to coddle it. The LAF’s anti-Hizbullah credentials will ultimately decide the quality of US aid. Israel has been very critical of the Lebanese government, accusing it of being little more than the handmaiden for Hizbullah and terror in the region. Indeed, Israeli officials recently revealed that their military has a plan to flatten government controlled regions of Lebanon if Hizbullah travels off the reservation as it did in 2006. 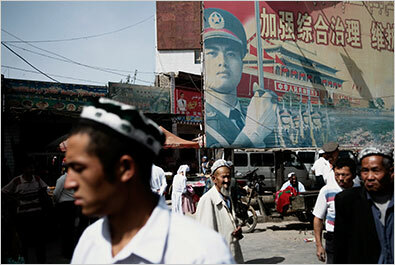 A People’s Liberation Army political poster in a town in Xinjiang, China, a region largely inhabited by Uighurs, an ethnic group uneasy with the government’s rule. China places intricate restrictions on Muslims in a vast autonomous region in an effort to control Islam’s spread……..
A new report based on previously classified documents suggests that the Nixon and Ford administrations created conditions that helped destabilize Iran in the late 1970s and contributed to the country’s Islamic Revolution. A trove of transcripts, memos and other correspondence show sharp differences over rising oil prices developing between the Republican administrations and Mohammed RezaShahPahlavi in the mid-1970s, says a report to be published today in the fall issue of Middle East Journal, an academic journal published by the Washington-based Middle East Institute, a think tank. The report, after two years of research by scholar Andrew Scott Cooper, zeros in on the role of White House policymakers — including Donald H. Rumsfeld, then a top aidetoPresident Ford — hoping to roll back oil prices and curb the shah’s ambitions, despite warnings by then-Secretary of State Henry Kissinger that such a move might precipitate the rise of a “radical regime” in Iran. …. Q: Do you think the March 14 [ruling coalition] can win? A:I strongly believe that the commitment of the majority of the people is in getting back to a situation where the state is in control. If it is a state run by Hizbollah, fine. But somebody is in charge. There is one captain. This situation is unsustainable where there are many captains. I believe in March 14 and the people who subscribe to what they say it stands for: democracy, openness, tolerance, independence, excellent relations with Syria. I am fully in favour of excellent relations with Syria but on the basis of mutual respect and on an equal basis. Equal partners. Syria is our neighbour and we have a history of thousands of years together, and we will be together for thousands more. Israel is an enemy, Syria is not an enemy. But we cannot and we should not continue to be a satellite state to Syria. These Sunni extremists are a scarecrow. I don’t mean that there are no Salafis [al-Qaeda-linked fundamentalist Sunni Muslims]. There are Salafis. But they are really creating this giant and magnifying it in order to create a perception that there is a need for a policeman. And at the same time, to intimidate. [If] they are coming from Anbar [in Iraq] they are coming from where, through where? They are coming through Syria? They are not coming by parachute. Instead of waiting for them to come in from Lebanon, they would do better to control them when they are coming from Iraq. All the people caught or killed in Nahr al-Bared did not come via legal Lebanese points of entry, they came through these porous points. Q: Are you ready for security coordination with Syria? A: On any issue we are fully ready to talk like two mature brothers. Syria is not an enemy it is a sister country, we are ready to co-operate on any matter that is good for both countries with all sincerity and openness. But as two mature brothers. Q: It is surprising that you say Syria is not an enemy, when there is a suspicion that Syria was responsible for the assassination of Rafiq Hariri? A: This matter is in the hands of the investigators and there is an international tribunal….. If oil prices continue to fall, Peres said, Iran will not be able to fund terrorist activities. Peres also visited the sukkot of Shas spiritual leader Rabbi Ovadia Yosef and Ashkenazi Chief Rabbi Yonah Metzger. The UN General Assembly on Friday elected Japan, Turkey, Austria, Mexico and Uganda to seats on the Security Council for 2009-10, rejecting bids by Iran and Iceland. As expected, heavyweight Japan defeated Iran, which is under Security Council sanctions because its nuclear program, for an Asian seat coming vacant on Jan. 1. Japan had 158 votes from the 192-member assembly and Iran only 32, mostly from Arab countries. In a three-way contest for two European seats, Iceland – an apparent victim of its grave financial crisis – scored 87 votes, well short of the two-thirds majority required. Turkey went through easily and Austria by a narrow margin. The election of Mexico and Uganda had been virtually assured since they were unopposed in their regional groupings. The General Assembly votes once a year for five of the 10 non-permanent seats on the 15-nation council, the powerhouse of the United Nations with the ability to impose sanctions and dispatch peacekeepers. The new make-up of the council is seen as favorable to Israel, after South Africa, which has championed a persistently anti-Israel policy, stepped down. “The notion of considering the nomination of a state that has threatened to wipe Israel off the map is unacceptable,” she said. Foreign Minister Tzipi Livni welcomed Japan’s accession to the council. “By thwarting Iran’s bid to join the Security Council, the United Nations managed to save face,” Livni said. The permanent members, which have veto power, are the United States, Russia, Britain, France and China. President Bush offered Syria an Iran-for-Golan deal, a Kuwaiti newspaper reported. Al Jarida said Friday that Bush made the offer in a handwritten letter delivered through Mahmoud Abbas, the Palestinian Authority president. According to accounts of the story appearing in Israeli media, Bush wants an accelerated Syria-Israel peace process that would give Syria the Golan Heights, the strategic plateau Israel captured from Syria in the 1967 Six-Day War, for Syria’s agreement to distance itself from Iran. If true, the proposal would mark an about-face in the U.S. position, which has been to discourage Israel from talks it is already pursuing with Syria. Israel wants to reduce Iran’s influence in the region, but until now the Bush administration’s position has been that the Bashar Assad regime is not a reliable partner. A Syrian author and opposition figure has been indicted on a charge of spreading lies undermining the state, a human rights group said on Thursday. Habib Saleh, who was arrested in May “has been indicted for having spread lies aimed at weakening national sentiment,” the Syrian League for the Defence of Human Rights (SLDHR) said. Saleh, 61, is also accused of having provoked “dissension aimed at triggering confessionalstrife,” and is due to appear before a Damascus criminal court, at an unspecified time, a statement added. Syrian human rights groups said earlier this year that Saleh disappeared after being arrested on May 7 by the security forces in the northwest town of Tartus as he was walking through the market. He went missing after having posted on the Internet political articles calling for the establishment of reform and democracy in Syria. In 2001 he was arrested along with nine other opposition militants and jailed for three years. He was again arrested in May 2005 for posting “lies” on the Internet and released in September 2007. Three Canadians who say they were tortured in Syria have been denied due process and fairness by a commission investigating Ottawa’s role in their detention, Amnesty International said on Friday. Retired Supreme Court Judge Frank Iacobucci, who headed the 22-month inquiry, is due to deliver his report to the government on Monday. A shorter version — stripped of sensitive information — will then be made public. Obama just received the endorsement of Colin Powell. This is a pretty big endorsement for Obama and it should be interesting how it affects the direction of the election from here on out. JERUSALEM (AP) — Israeli leaders are seriously considering a dormant Saudi plan offering a comprehensive peace between Israel and the Arab world in exchange for lands captured during the 1967 war, Defense Minister Ehud Barak said Sunday. Barak said it may be time to pursue an overall peace deal for the region since individual negotiations with Syria and the Palestinians have made little progress. Barak said he has discussed the Saudi plan with Prime Minister-designate Tzipi Livni, who is in the process of forming a new Israeli government, and that Israel is considering a response. Saudi Arabia first proposed the peace initiative in 2002, offering pan-Arab recognition of Israel in exchange for Israel’s withdrawal from Arab lands captured in 1967 — the West Bank, Gaza Strip, east Jerusalem and the Golan Heights. The 22-member Arab League endorsed the plan last year. Israel has said the plan is a good basis for discussion, but expressed some reservations. “There is definitely room to introduce a comprehensive Israeli plan to counter the Saudi plan that would be the basis for a discussion on overall regional peace,” Barak told Israel’s Army Radio. He noted the “deep, joint interest” with moderate Arab leaders in containing Iran’s nuclear ambitions and limiting the influence of Hezbollah in Lebanon and Hamas in Gaza. While Israel’s outgoing prime minister, Ehud Olmert, has welcomed the Saudi plan, he and other leaders want to keep small parts of the territories captured in 1967. Israel also objects to language that appears to endorse a large-scale return of Palestinian refugees to lands inside Israel. Israel says a massive influx of Palestinians would destroy the country’s Jewish character. Israel’s ceremonial president, Shimon Peres, proposed putting Israel’s various peace talks on one track last month at the United Nations, calling on Saudi King Abdullah to “further his initiative.” He has since been pushing the idea in meeting with Israeli, Arab and Western officials, his office said. While Peres has no formal role in Israeli foreign policy, he is a Nobel peace laureate and well respected in the international community. In Sunday’s interview, Barak said he was in full agreement with Peres. “I had the impression that there is indeed an openness to explore any path, including this one,” he said of his talks with Livni. Barak, who leads the Labor Party, is expected to play a senior role in the next administration. Livni’s office refused to comment on her talks with Barak. Palestinian negotiator Saeb Erekat noted that pursuing the Saudi peace initiative did not necessarily undermine the direct talks between Israel and the Palestinians and he encouraged Israel to pursue this track. When I grow up, I would like to do something creative, exciting, and controversial. Maybe I’ll be an avant-garde theater director, and live on La Rive Gauche. Or perhaps an acrobat with the Cirque de Soleil, turning tumbling feats in the air and making the ladies faint with delight and terror. Or maybe I will be an editor of a Kuwaiti newspaper. Yes, I think that is the ideal venue to exercise my creativity. I will let my imagination wander free, inventing stories while I sip my morning coffee. I can just see the headlines now, at my lovely Kuwaiti newspaper, provocatively titled al-Wahm. HOT OFF THE PRESS: Iran reportedly tried to pay Arab League to officialy change name of “Arabian Gulf” to “Persian Gulf”, but was rebuffed!! what can’t you wait for? The German investigators dicovery? didn’t Mehlis said that before? Last time Haaretz quoted a Kuwaiti newspaper was when Syria supposedly kicked Meshaal out of Damascus. I wrote to the journalists who reported that story at the time to express my surprise that he believed the story, he told me that he agrees it looks like a hoax, but he said these stories, once published, acquire a life of their own, so he decided to publish it simply because others will. Actually he said that by now he realizes that 1) a Kuwaiti newspaper 2) quoting an unidentified Palestinian source, is the most suspicious combination. (Corruption on the Rise in Syria) are Syrians really want to change? Is the government doing anything regarding corruption? What a bunch of looser they are. from 93 to 147!!!!!!!!!!!!!!!!!!!!!!!!!!!!!!!!!! (Amnesty slams probe into Canadians jailed in Syria) what does those trio want from the Canadian govt, they said that they’ve been tortured in Syria, well, why don’t they sue the Syrian government and make an example of it instead of bugging Canadians with their stories. (Syria indicts opposition figure for spreading ‘lies’) they must stop this ridiculous game; it’s getting unbearable and so annoying. Maher Arar got 10.5 million dollars of compensations for his ill treatment by Syria and neglect by Canada. Wouldn’t the trio try to get something from the canadian government? I didn’t mention the money issue because I don’t want my comment to sound unfair and judgmental. I’ll argue that they just want to have justice no more and I think blaming the Canadian for what the Syrian authority did to them is not right, it’s unfair for Canadians and unfair for Syrians, since the Syrian should be the one paying for what they did not the government that accepted those people to be it’s citizens and treating them with dignity like any other Canadians. If they are looking for a fair game they have to put the Syrian authorities accountable even thought they probably won’t win anything but they make their story meaningful and they will get support not sympathy. From my side, I feel sorry for what Mr. Arrar went through but my feeling toward him is more out a pity than respect. Will the US pay or even apologize to what they did to the Guantanamo prisoners, ill treated for 7 years? The US has much more money to support their claims of democratic justice than Syria. Do you seriously expect Syria to apologize and pay compensation for the sake of “Justice”? No, I don’t expect Syria to do that, I just want Syrians in any position they are to know that they are going to be hold responsible for any bad decision or harm they do and that they are not going to get away with it. Don’t you think that we are loosing justice in many level of our normal daily life because of that? Starting with a shopkeeper who steel from his customers to the policeman who beat people in the street to the engineer who you can bribe to build an illegal and ugly room, what I want is just to make people feel afraid of the “law” not their bosses and The “state” not the moukhabarat. To be very clear, I’m not even convince about the trio story, I just feel that many Syrians now are loosing their dignity and the pride of being Syrian because of not dealing with the situation the right way. We are not looking into our internal issue the same way we look at our international ones, there should be a starting point for that and everyday we don’t do it we are loosing a fight for a better Syrians. The real news is the absence from the news of any new thinking or initiative in the Arab and Muslim world. Let me explain the situation: in Africa a traditional method of catching a monkey is to put a lump of salt in a hole in the base of a tree big enough for the hand to enter and small enough for the fist that holds the salt to remain stuck. The monkey will not let go of the salt and will doom itself to capture. This is the only news that comes out of the Arab world: the monkeys are holding on to power no matter what. Siniora wants to remain prime minister of an empty goverment where the state has effectively ceased to exist. The Maronites are celebrating the Festival de la Francophonie just when France has lost its ability to have an independent foreign policy without the cover of the EU. La Vache qui Rit Mubarak is making the Sphinx look young in comparison to the total immobilism in that country. Qaddafi is just experimenting with a new wardrobe from Nigerian tailors. Boutaflika has gone apoplectic as he lost a few more hairs to the wind. The worst of them all is of course Abbas who does not even have permission to wipe his behind without an OK from Livni. As for Syria, at least the computer games are running to keep everyone entertained. Apparrently Livni and Olmert gave Abbas permission to celebrate the glorious Palestinian resistance fighters (aka “terrorists” in Zionist parlance). Weekly Standard) This column was written by Hassan Mneimneh. Seven years after 9/11, Washington policymakers remain fundamentally confused about the nature of Islamist extremism, the ideas behind it and the states that manipulate it. In few places is this problem more obvious than in the U.S. relationship with the secular Assad regime in Syria. After the most recent iteration of the on-again off-again Washington-Damascus relationship–a meeting between the Syrian Foreign Minister Walid Muallem and Secretary of State Condoleezza Rice–Muallem described the meeting as a “positive beginning of a dialogue” while the state-controlled Syrian press heralded it as the United States coming to its senses and joining Syria in the fight against the common threat of radical Islamism. Never mind that some of those radical extremists threatening us are in the employ of the Assad regime and may well have been behind a recent bombing in Damascus that killed 17. Never mind, also, that the price that Syria is actively seeking for its promise of cooperation is the restoration of its influence on Lebanon–a dominion that it had to abandon in the aftermath of the Cedar Revolution of 2005. Damascus has long epitomized a “nuanced” understanding of Islamist terrorism. Hamas, Islamic Jihad and Hezbollah have earned Syria’s endorsement and significant material backing. Similarly, authorities in Damascus have fueled the insurgency in Iraq, a platform championed as praiseworthy “resistance to U.S. occupation.” Under the watch of Syria’s intelligence services, the most virulent radical jihadist networks have relied on Syria as a thoroughfare through which to channel streams of suicide bombers and other jihadists into Iraq. And while they have vociferously denied official leverage over such networks, Syrian authorities, when exposed, have displayed an astonishing ability to redirect radical jihadists to less conspicuous terrain such as to Northern Lebanon. Damascus has nurtured jihadism as a bogeyman at home and abroad, an insurance policy against the specter of regime change, and a scapegoat for crimes otherwise traceable to its state security forces. To be sure, a dangerous strain of the Muslim Brotherhood has menaced the Assads from the shadows for many years. But since a Syrian military massacre in the Brotherhood enclave of Hama in 1982, their specter has been far fainter than the government has allowed. The Syrian regime perfected its bifurcated approach to Islamist militancy over the course of its decades-long occupation of Lebanon. Groups such as Hezbollah were managed by the dominant Syrian security services. Other factions such as Asbat al-Ansar and the 2000 Dinniyeh group were deemed more useful when employed as proxies from controlled enclaves–Palestinian refugee camps and remote mountain refuges–to be unleashed at key tactical moments. The February 2005 assassination of Syrian rival and former Lebanese Prime Minister Rafiq Hariri occurred in an environment saturated with Syrian services, though in the pro-Syrian narrative it was a crime attributed to a jihadist cell. In 2006, shortly after Damascus was forced to withdraw its forces from Lebanon, in the Palestinian refugee camp of Nahr el-Bared in northern Lebanon, a pro-Syrian faction delivered a Syrian-supplied arsenal to the Sunni Jihadist group Fatah al-Islam. The group, under the command of Jordanian terrorist Shakir al-Absi (who had just completed an unusually short stint in Syrian jail), launched a costly challenge to the struggling democratic government of Lebanon. Only American, Arab, and international support enabled the Lebanese armed forces to prevail. In the Syrian government’s lengthy record of employing radical jihadism, it has deemed the repercussions of this approach counterproductive only when its interests have in turn been targeted. And even then, attacks inside Syria have been intentionally recycled to tighten the regime’s grip on Syrian society and to underline Syria’s notional role in fighting global terrorism. But the most recent terrorist act committed in Damascus indicates that trafficking with jihadists has indeed become an increasingly risky mechanism for Syria. Syria’s leadership may have overestimated its ability to ride the tiger. It is not clear who bears responsibility for the terrorist attack in Damascus–whether it is Fatah al-Islam or jihadists destined for Iraq. Contemplating a return to Lebanon, Damascus lays the blame on Islamists in Northern Lebanon. Either way, it clearly marks the backfiring of Assad’s manipulation of radical Islamists. And what do all these machinations matter to Washington? Assad and his circle see a possible rapprochement with the United States playing into a new role for the regime: partnership in the war on terror. But Condoleezza Rice, her employees and her successors should remember that as Syria turns the full force of its tyrannical regime on one jihadist enemy, reinserting itself into the frail democracy that is Lebanon, it will continue to nurture Hamas, Hezbollah, and others who are little different. Syria’s choice should be simple: an end to support for all terrorism and respect for Lebanon’s independence, or America will sit on the sidelines and watch a dictatorship that lived by the sword die by it. By the way the Haaretz and Israeli officials language is little disturbing in this case. Jewish fire bombers are called hooligans. Palestinians throwing fire bombs are called always terrorists and the religious police doesn’t bother to arrest them. They shoot them, minor or not. Surely the there is no difference with a Molotov cocktail if it is thrown in a house by a Jew, Muslim or Christian. Well it seems that in Israel there is, why Akbar? Lets call these Israeli Jews also terrorists in the name of equality and fairness. Well Israeli Mossad, the tool of the religious regime, knows everything that is going on in Israel. So the regime must be behind these recent fire bombings. Akbar as we know USA supports and finances Israel. So can we call in your “Memri language” USA a terrorism supporting and financing country? A new poll commissioned by researchers at New York University reveals that American Jews favor Democratic presidential frontrunner Barack Obama over his Republic rival, John McCain, by a 67 – 33 margin. The survey, which sampled the opinions of over 3,000 respondents – half of them being Jewish – also found that Jews as an ethnic group will support Obama by almost 30 percent more than other white, non-Hispanic voters. The poll sought to gauge the importance Jewish voters’ attach to Israel as a consideration in whom they would vote for, with some surprising results. Of all the Jews surveyed who said that Israel is of “high” importance, 63 percent said they would vote for Obama. In constrast, just 42 percent of Jews who said Israel has “very high” importance intend on voting for Obama. Not surprisingly, the Jewish vote swings heavily in McCain’s favor among the Orthodox. According to the survey, the Arizona senator can count on support from 75 percent of Orthodox Jewish voters. The poll was conducted this past September, when the gaps in poll numbers between Obama and McCain were smaller. Given the recent numbers heavily favoring Obama, the survey’s authors project that the ratio of Jewish voters backing the Illinois Democrat would swell from 2-to-1 to 3-to-1. The three Canadian-Syrians are going after Canada for its role in their detention. Ahmad El Maati, Abdullah Almalki and Muayyed Nureddin were arrested separately when entering Syria between 2001 and 2003. They say they were tortured and interrogated, and some of the questions they were asked were based on information that could only have come from Canada. off course, the Canadian authorities blocked the probe and that is why amnesty is upset about the issue. As for the money, government are much like poeple, their pocket books is where hurts and if you want to prevent them from doing bad things, you have to use any legal means to make the price very expensive. (click on the door at least 3-4 times). And don’t forget the bridge on her desk! I’m just wondering .. what if Sarah gets the last laugh. Hi OTW, It’s always nice to read your comments. Regarding Champress photo; I didn’t mean the CO2, I find the sentence itself to be funny since it doesn’t give any message neither to have a real meaning to it. It sounded like a joke..